Typically, we mark the end of the fiscal year, which will occur on Monday, by reviewing important numbers for the previous fiscal year. This year, one number sticks out – $2.4 trillion, or more precisely $2,423,000,000,000. That's how much lawmakers added to the debt through 2027 by enacting fiscally irresponsible legislation throughout fiscal year (FY) 2018. Legislation passed this fiscal year will add $445 billion to the deficit next year alone. Two pieces of deficit-financed legislation explain the vast majority of this increased borrowing – the Tax Cuts and Jobs Act of 2017 (TCJA) and the Bipartisan Budget Act of 2018 (BBA18). Looking at next year alone, TCJA is projected to add about $230 billion to the deficit, including its effects on interest costs and economic growth. BBA18 is projected to add another $190 billion. Other legislation, including to delay health-related taxes, provide for disaster relief, and fund the government, is projected to add about $30 billion. 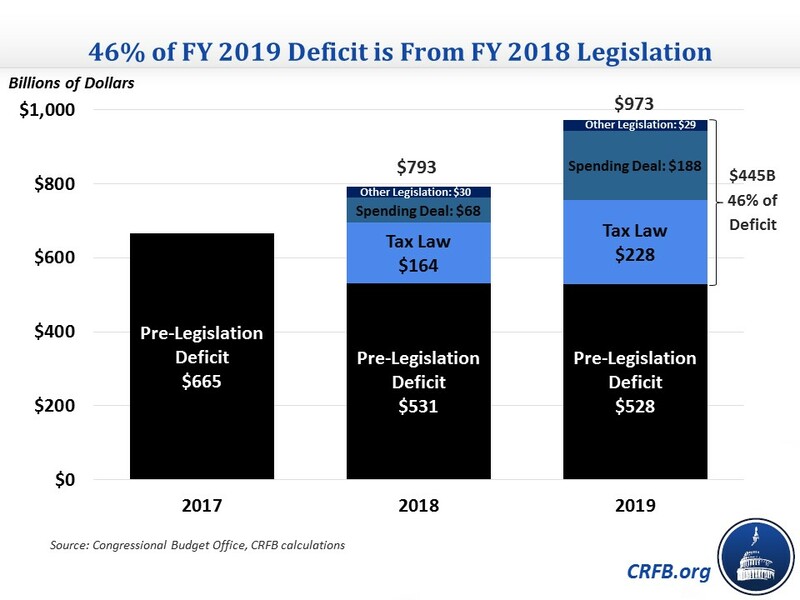 Taken together, legislation enacted in FY 2018 will add $445 billion to next year's deficit, enough to explain nearly half of the near trillion-dollar deficits the country is likely to face. Over a decade, TCJA – which is mostly in effect for eight years (compared to two years for BBA18) – is responsible for the vast majority of debt increases enacted in FY 2018. The Congressional Budget Office (CBO) recently estimated that the law will add $1.9 trillion to debt through 2027. The spending bill will add another $420 billion to the debt through 2027, mostly in the first three years. Other legislation will increase deficits by a combined $115 billion. At a time when debt is already at record-high levels and growing unsustainably, the $2.4 trillion added to the projected debt over the past year is incredibly irresponsible. These changes alone will increase projected debt from 86 percent of GDP to 94 percent. Sadly, this might understate the situation. The laws enacted over the past year are mostly temporary as written – though their design suggests an interest in permanency. 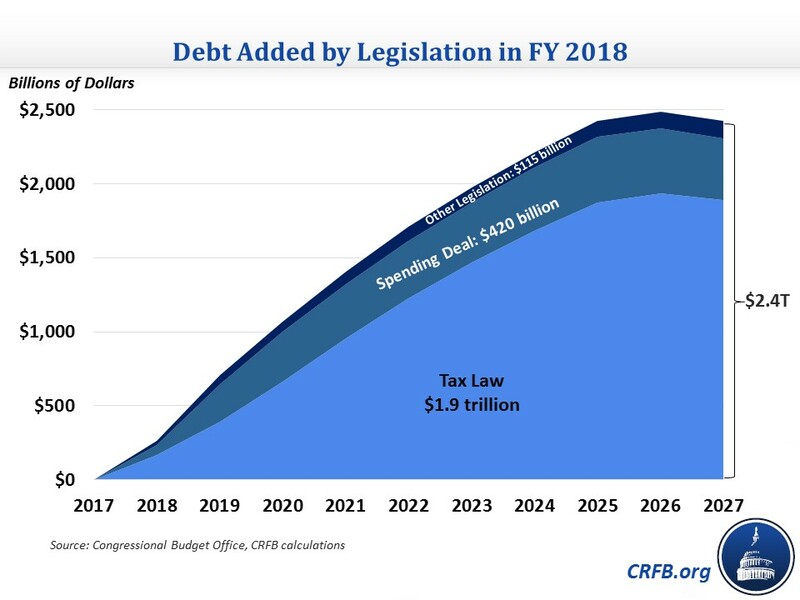 Assuming policymakers extend all legislation enacted over the past year, we estimate a total cost of roughly $5 trillion and debt levels reaching nearly 104 percent of GDP by 2027. Lawmakers must not allow this to happen because if future fiscal years are as irresponsible as this year, our nation's government and economy will likely suffer.